Picture the effect of a stroboscope running… you know, when everything is moving like greased lightning. OK, so now take that image and apply it to a person caught in its glare… except when I saw Jesse Malin moving at the speed of light,there was no stroboscope running… he was doing this manic routine under his own steam. No big deal you might think… OK, so how about if I elaborate a little and say that I witnessed this extraordinary burst of energy at the end of an incredible 2-hour show, by which time every fibre of Jesse Malin’s clothing was saturated in sweat and quite literally clung where it touched? Maybe that’ll give you an idea of the energy that filled the stage at the Cockpit for the entire duration of Jesse Malin’s performance. God knows if he’d keeled over through dehydration I wouldn’t have been surprised. Before I went along to this show, I was very much in the yeah-heard-of-him-but-hadn’t-seen-him mode… but jeez, now that I have had a few days to reflect, hand on heart, I was seriously impressed. Not that I hadn’t enjoyed listening to both of Jesse’s recent CD releases, The Fine Art Of Self Destruction and The Heat, because I very much have. But there is a difference between listening to songs on a CD and watching them being performed live. Accompanied by Simon and Garfunkel’s Only Living Boy In New York, Jesse Malin quietly walked towards his center-stage microphone and it was a bit like watching a scene from a “Rocky” film. Not that there is any physical resemblance between Jesse Malin and Sylvester Stallone I hasten to add, but the look of sheer determination to succeed no matter what, was there for all to see. From the second that the house lights went down, it was like blast-off… and for the next couple of hours, we, the audience, were transported musically to another planet. The significance of the Simon and Garfunkel song stems from the fact that they, like Jesse Malin as well as the Ramones, hail from Queens, NY. As far as noticeable influences in Jesse’s performance/stage persona are concerned, the Ramones and Cheap Trick certainly came into my mind. Maybe a bit of Neil Young and Bruce Springsteen here and there too, but essentially, Jesse Malin is his own person, with his own style and his own unique ideas about how he wants to present his music to the world. Prior to the Leeds’ show, Jesse very kindly took time out to talk to me. Not only was I captivated by the intensity of his incredible, dark brown eyes, but also by the level of pure and undeniable passion that came across when he was talking about his music. As far as the hospitality area was concerned, let’s just say that it was functional so I began by asking Jesse a fairly direct question. So what’s a nice guy like you doing in a place like this?? So you’re not fussy then? Well, I’d like to think we’re growing into nicer venues but occasionally we slip back into something… and sometimes the dirtiest, wackiest places can be the most fun. But it’s really the people who make the place… the rest is just superficial. And yet, this is your 4th visit to the UK this year? Probably… it seems like… I don’t know… a million?! OK, so I guess the 64,000 Euro question is: what is it about the UK that keeps bringing you back? Well, I think we had the record – my first record – The Fine Art Of Self Destruction, out here before the States. And, I toured here opening-up for Ryan Adams last January in big venues so I just got to reach a lot of people with that… and the audience started to build here. The new record, The Heat, is actually selling more in America and this year I have been focusing on the home turf, touring North America more than here. But there are always calls for Festivals and different tours like the Counting Crows… we did support for them. And then promoting The Heat… I keep busy… I like to be on the road; so between here and America it seems like I’m out a lot. I like to tour and do something like 270 shows a year. You know… you make the donuts, you wanna sell the donuts and I guess we’re a bit like traveling salespeople… it’s what you kinda do. It’s not like we’re gonna get on every radio show or TV channel or be put up on big billboards or stuff like that. So we have to get out there and grab it on our own and just keep building. I love to work, I love to play… I don’t like sitting home too much so if there are opportunities to come back to the UK four or five times a year, I’ll be here. Talking of “back”… can you still remember that “moment” when you knew that all you wanted to do was to become a musician? Yeah, I was about nine or ten, I think… I got a crappy acoustic guitar and then I bought an electric guitar off some girl in the 4th Grade Class and I used to pretend to play KISS songs with a bad lead! And then I ended up in a talent show and went on stage dressed-up as Gene Simmons, spittin’ ketchup at the kids… and the audience in the auditorium applauded… so I thought well, this was good… and the girls started to notice me. I used to be like the “fool” in the class – I guess I still was – but I felt like it gave me this “power” and that was when I felt that music was what I wanted to do. So yeah, I’ve known since I was about nine or ten and I’m still trying to do it! So when do you find time to watch films? OK, I’ll raise my hand and tell you that the reason I heard about you and your music was because of Bruce Springsteen’s Holiday Shows last December. Yeah… and consequently, I’ve read interviews that have leaned heavily towards comparing you to the likes of Bruce which I guess must be an occupational hazard? I thought maybe they were trying to compare me to the likes of Mellencamp or Elton John! I dunno… I think people will always try to compare me to other artists like Neil Young, the Ramones, Counting Crows, the Clash, Bruce Springsteen… I just like a lot of different music. 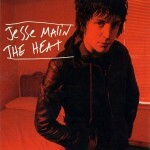 It’s always a bit like putting a label on a box… but I’m Jesse Malin and I am what I am. On the other hand, if fate decided to give your musical profile a boost, I can think of people a lot less notable that Bruce Springsteen to be compared to and/or associated with – or?? Yeah, he’s very supportive… he’s a great guy. We played small shows… nice, intimate, whole family Holiday rock and roll charity shows… really great to be a part of. far as touring is concerned. What is it that drives you to tour to those limits? Rock music – people – the energy – the adrenalin – the high you get from playing… you just connect to it. You know that way you feel when you come back from a l o n g vacation with your family and you’re totally burned out and shot? Well, that’s how it feels every day when you’re on the road except that you’ve got to carry on and get on stage so that makes a difference. And you eat bad, you sleep bad, you play dirty shows and you travel around with people all for that two hours on stage… and that’s what makes it worth it. You’ve been quoted in other interviews as saying the lyrics in your songs as well as the stories you tell between them are based on your childhood memories and when you were growing up… altogether a very personal insight into your life. So, how do you feel about performing in a country where English is not the native language and yet, the audience is reacting big-time to the catchy, melodic hooks of your music as opposed to them understanding what you are actually singing about… does that devalue your songs and/or song-writing in any way? No… I think there’s an instinctive thing with melody and with phrasing and sound so they don’t always have to understand what I’m saying. I mean, there was a band when I was a kid called Plastic Bertrand and the song was called Ca Plane Pour Moi and I didn’t know what he was singing about at all. But I liked the song. Sometimes it sounds pretty cool to hear artists singing in a different language, like Blondie or the Beatles or the Clash, I think that’s cool. But I think people have accepted that English is the common language for songwriting. I just try to write from the human heart and hope that it gets across. to tour the UK with you? Yeah, well… I had to pay them! Oh, that’s a bit of a drawback! Yeah… well we’ve got Justin here who’s making a lot of noise… he’s on guitar; and Christine –she’s not a guy – plays keyboards; and Steven who just walked in, on drums; and Johnny Pisano on bass. So what do they do when they aren’t working with you? I dunno… I think they just go off and get on with their lives you know… do their own thing. But I’ve had this band for just under a year now and I like to have the same musicians and not hire people. I like to try and have the same core of people like the way Bruce has the E Street Band or Elvis Costello has the Attractions. But I also have the freedom to play as a solo artist. It’s to tour for the next few months, make another great record, hopefully a better record, hopefully make my best record EVER; make lots of money, have kids – although that’s not a career! Keep making records, keep out of bad day-jobs, constantly grow as a force and as a person… and do the best I can and play as much as I can. And when can we see you in Germany?? I dunno… I really want to come there soon. I plan to talk to my record company about it this week and I will ask that question. Yes, it’s almost show time! But love to Germany, love to the French, love to the English, love to the Irish and… thank you for coming. And thank you for taking time out to talk to me. So there you have it… an evening with Jesse Malin at the Cockpit in Leeds turned out to be one amazing experience. And long may he continue to be able to walk amongst the crowd during the course of a show and invite the audience to sit on the floor by way of making a statement about the world we live in. As for his Ramones-esque version of Hungry Heart that brought the performance to a well-earned close? Well, there is absolutely nothing I, or my thesaurus can say that would do justice to Jesse’s version of this Springsteen classic… you simply had to have been there.